People who are deafblind have many different ways of communicating. The methods they use vary, depending on the causes of their combined vision and hearing loss; their education background; their ability to rely on residual vision or hearing and whether they had acquired language before becoming deafblind. How do people who are deafblind communicate? Irish sign language (ISL) is the sign language used by the vast majority of people who are deaf in the Republic of Ireland and in some parts of Northern Ireland. ISL is a visual language that incorporates movements and shape of the hands, body, gestures and facial expressions. ISL has it’s own grammar and structure and is different from other national sign languages such as British Sign Language (BSL) and American Sign language (ASL) but does have some influence from others such as French Sign Language (LSF). Irish Sign Language has no official status in Irish legislation but is currently the subject of a Recognition of Irish Sign Language for the Deaf Community Bill 2016 to get recognition and uphold the status of ISL particularly in education. Tactile or hand-over-hand sign language is where the person who is deafblind puts his or her hands over the signer’s hands to feel the shape, movement and location of the signs. Some signs and facial expressions may need to be modified and one-handed or two-handed tactile sign language can be used. People who grew up using ISL in the deaf community may prefer tactile ISL, while others who came from an oral background or learned signs later may prefer a more English-based tactile system. Usually people who are visually impaired who lose their hearing later, or deaf or hard of hearing people who have depended on their speech reading and do not know how to sign, prefer tactile fingerspelling because sometimes sign language can be difficult to learn. The person who is deafblind may prefer to put his or her hand over the fingerspelling hand, or on the signer’s palm, or cup his or her hand around the signer’s hand to understand what is being communicated. 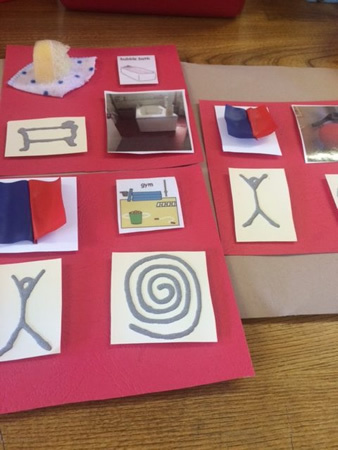 The Picture Exchange Communication System (PECS) can teach people who are deafblind with some usable vision to communicate what they would like by choosing pictures from an array of options. The system then goes on to teach how to put the pictures together in sentences, answer questions and comment. A number of computer apps such as the Grace app have been developed to enable people with communication needs to use mobile phones, tablets and computers to access a large range of PECS instantly. An ‘object of reference’ is, as the name implies, an object which has a particular meaning associated with it. For example, a fork may be the object of reference for dinner. The object is closely associated with and comes to represent another object, an activity, a person or an event. These objects give a person who is deafblind information about what is going to happen if they are used consistently. Braille is a writing system which enables people who are blind and partially sighted to read and write through touch. It consists of patterns of raised dots arranged in cells of up to six dots in a 3 x 2 configuration. Each cell represents a letter, numeral or punctuation mark. Some frequently used words and letter combinations also have their own single cell patterns. Swell symbols are tactile, raised line drawings that allow people who are blind or vision impaired to feel maps and graphics with their fingertips. To create Swell Symbols, pictures are printed on to specialist paper, through a standard printer or photocopier and are then run through a Swell-form Graphics Machine. The black ink then reacts to heat inside the machine and swells to create a tactile image. Tactile images can then be used, in a similar way to PECS for people who are deafblind to communicate what they want or plan the day ahead. This method of communication, famously used by Helen Keller and Anne Sullivan, allows people who are deafblind with little or no usable vision to speech read another person by touch. The person who is deafblind puts their thumb on the other person’s chin, and their fingers on the other person’s cheek to feel the vibrations of the person’s voice and the movement of their lips. This method is rarely taught or used nowadays. To watch Anne Sullivan speak about teaching Helen Keller to communicate using Tadoma click here.